> Home > News > Dress for the cause! During the month of October, employees of our offices in Montreal and Quebec joined the head office (Boisbriand) to participate in the fundraising "Dress for the Cause" of the Breast Cancer Society. 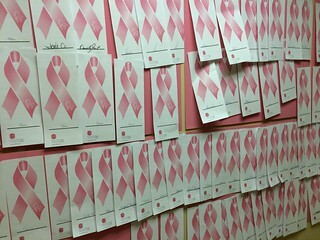 Several activities were organized in the 3 offices, such as the sale of ribbons, snacks and coffee, along with a special “dress in pink” day! The 3 offices have raised $ 1383.50, which the company has added another $ 1,000 for a total of $ 2383.50.